The media, and especially the televisions, said on the news that “a very peculiar demonstration took place in the central Paseo de Gracia of Barcelona”. And they were right, because the locals had never seen so many Roma flags waving in the wind and so many young people, men and women parading along the broad sidewalks of the most important avenue in the Catalan capital. We made a short route, about five hundred meters. That is the distance between the seat of the European Parliament and the Commission in the city of Barcelona and the Italian’s Consulate, located on Mallorca street, on the corner of Via Laietana. But this distance was enough for the protesters (the Barcelona police, who always count downward, and some newspapers say that we were “several hundred”. 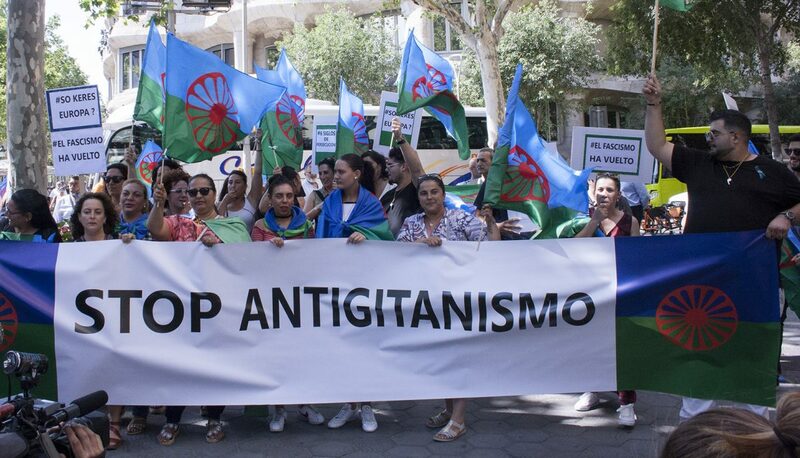 We have numbered between 480 and 510 people) to shout with enthusiasm, not without rage, “Salvini resignation, trial and prison”, “we are Roma, we are Catalan, we are Spanish, we are Europeans”, “Romaphobia is the same as fascism”, “we are brothers, Italian Roma People”. The pedestrians, and especially the tourists who contemplated “La Pedrera”, a masterpiece of Gaudí like the Holy Family, looked at us surprised and among them, quite a few Italians applauded and congratulated us, expressing their satisfaction for our protest. 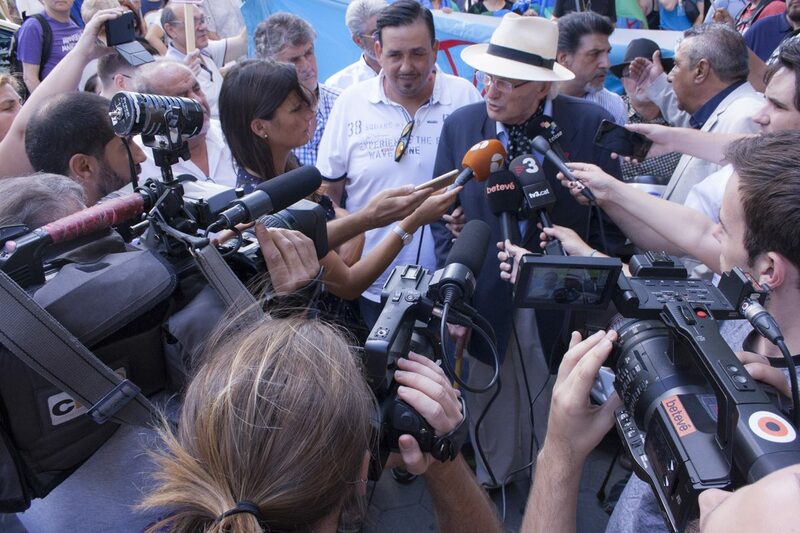 A lot of Spanish media followed our demonstration, but also several Italian media correspondents picked up our statements. Unfortunately, TVE (Public Spanish Television) ignored us. Our march through the streets of Barcelona led us to the headquarters of the official representation of the European Union’s Commission. We were kindly received by the highest representative of this institution in Catalonia, Mr. Ferran Tarradellas, to whom we delivered a message addressed to the president of the Commission in Brussels. In the text we express our repudiation to the Minister Matteo Salvini with the request that this letter had official entry into the European government. Europe is living a bad moment. The racists have found a suitable moment to attack the weakest, which they consider inferior beings. And the Roma know a lot about that. 500,000 of our brothers were victims of the Nazi horror during the World War II and during the last years we are being victims of the European extreme right. The racists are not able to value in us that we are the people that, possibly, have paid the highest price for remaining a free. It is not necessary to look too far. Two days ago, a group of young hooded Nazis attacked a humble Roma settlement in the city of Lviv in Ukraine. They killed a 24-year-old man with a knife and wounded four more people: a 10-year-old boy, two 19-year-olds and a 30-year-old woman. Four other children and a pregnant woman were also attacked. Well for the Spanish’s Congress of Deputies! The Italian Interior minister who hates and despises us, should learn from the Spanish’s Congress of Deputies that has just approved, with the unanimous vote of all the members of the Chamber, a courageous and committed message of support for European Roma. And also, a message of clear rejection to the words and intentions of the evil Matteo Salvini. Minister Salvini hates us because we remain standing after having been persecuted for so many years. That’s why he wants to control us by taking the fingerprints of our young children. And he despises us because he knows that, despites Roma people had suffered, we are a people that has known how to preserve for centuries its culture, its language, its customs and its traditions. Citizens of Barcelona should know that the liberation movement of the Roma community in Spain was born in Catalonia 60 years ago by committed Catalan people such as Narcís Prat, Camprodon, Jordi Maria García-Die and Pere Closa, the Catalan he carried the cry of protest against the marginalization of the Roma to Andalusia. His remains rest in the cemetery of Granada, surrounded by dark angels, whose figures were personally paid by the Andalusian Roma. The demonstration that took place in Barcelona on Wednesday, became a cry to tell European governments stop Romaphobia. That together, Roma and “gachés” (non-Roma) we can build a more just and fraternal society where we can look at each other in the eyes, cleanly, with respect and solidarity.